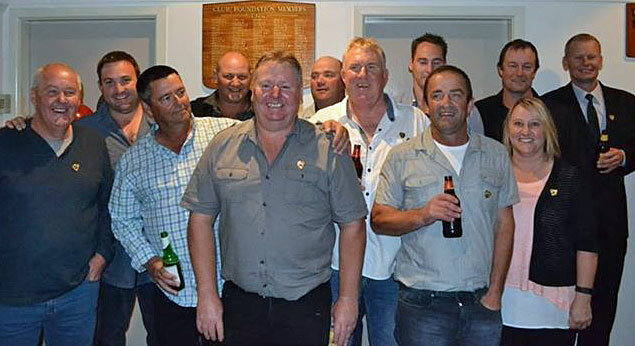 Life members at the New Norfolk Cricket Club trophy night. 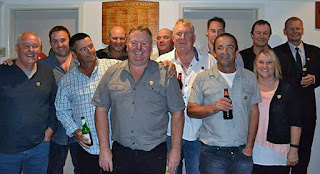 IT was one of the biggest attendances in years when 80 people turned out to the New Norfolk Cricket Club's annual dinner and trophy night at the New Norfolk District Football Clubrooms recently.on Saturday night. Among the many highlights of the evening were the naming of the first grade bowling average trophy after the late Ashley Morgan, who was a great player, clubman and life member of the club. Meanwhile Josh Walsh was awarded the Charlie Eiszele best clubman award for all his hard work with the juniors and for his help with the committee during the season. The coaches for next season were also announced on the night. Todd Rusher was reappointed as senior coach, while Jason Rigby was named assistant coach and Seb Wishart was appointed to the position of development coach. Rigby and Wishart both come to the Red Caps from the St Virgil's Cricket Club, but Rigby has spent most of his career at the New Town Cricket Club. All three coaches will be looking to build on the 2015/16 season in which the club did very well in fielding three senior teams, two junior teams and also four T20 Blast teams. The New Norfolk Cricket Club is in a sound position with a bright and exciting future. Well done to club president Jamie Hill and the officebearers and committee members on their efforts. Season 2016/17 should bring much success both on and off the field. Batting aggregate - 1st Grade: John Ferguson 557 (donated by Tammy Hill); 4th Grade: Leigh Berry 220 runs (donated by Rohan Heron); 6th Grade - Brad Kemmler 228 (donated by John Ferguson). Batting average - 1st Grade: Joe McCulloch 37.75 (donated by NNDFC clubrooms); 4th Grade: Leigh Berry 44.00 (donated by Stewart and Sharyn Rice); 6th Grade: Blake Kemmler 31.75 (donated by Nathan Heron). Bowling aggregate - 1st Grade: John Ferguson and Joe McCulloch 25 (donated by Graeme Rowlands); 4th Grade: Shannon Long 17 (donated by Ben Shaw); 6th Grade: Brad Kemmler 31 wickets (donated by Liahm O'Brien). Bowling average - 1st Grade: Joe McCulloch 10.36 (donated by the Morgan Family); 4th Grade: Shannon Long 12.24 (donated by Jamie Hill); 6th Grade: Graeme Rowlands 12.07 (donated by H. and J. Hannibal). Best all rounder/club champion - Lyn Harris Memorial Trophy: John Ferguson 874 points (donated by Daniel and Anita Vagg); 4th grade: Jamie Hill 438 points (donated by Ben Shaw); 6th Grade: Brad Kemmler 583 points (donated by Tas Fresh). Most catches - 1st Grade: Harry Booth 11 (donated by Glenn and Robyn); 4th Grade: Jamie Hill 7 (donated by Stephen Nichols); 6th Grade: Brad Kemmler 9 (donated by Banjos New Norfolk). Best fielder - 1st Grade: Aaron Drew 15 votes (donated by Video Ezy Claremont); 4th Grade: Jamie Hill 7 votes (donated by Daniel and Anita Vagg); 6th Grade: Trent Smith 8 votes (donated by Tas Fresh). 5fas - 1st Grade:Joe McCulloch 5-13 (7.2) v Rokeby; 4th Grade: Shannon Long 6-20 (7.2) v Knights and Jake Wessing 5-35 (7.1) v Bagdad; 6th Grade: Graeme Rowlands 5-21 (8) v Old Beach (all donated by Craig Farrell MLC). Other awards - Best first year player: Liahm O'Brien (donated by Clay and Raelene Kemmler); Coaches award: Josh Rowlands (donated by Todd Rusher); Duck award: Liahm O'Brien (donated by Damien Tubb); Charlie Eiszele Perpetual Trophy for best club person: -Josh Walsh (donated by Adrian Eiszele); Best Under 21: Mitch Rice 338 points (donated by Glen and Rachel Williams); Most improved- Lokki Dootson (donated by Leigh Berry); Encouragement award: Shayne Upton (donated by Josh Walsh).